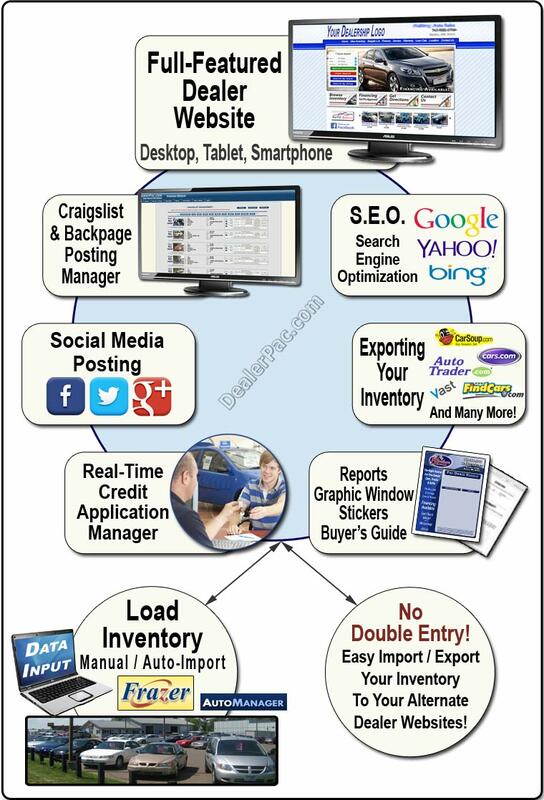 DealerPac - Web / Inventory Mgmt. Powerful, Full-Featured Internet Marketing System Designed For Today's Dealers! ONLINE MARKETING... IT'S ALL ABOUT INCREASING YOUR INTERNET PRESENCE! BE SEEN ON ALL THE SEARCH ENGINES WHILE MAKING A GREAT FIRST IMPRESSION OF YOUR DEALERSHIP TODAY! A Great, Low Cost Method Of Increasing Your Internet Presence At An Affordable Price While Receiving A Powerful Dealer Website Marketing System! Great... Did You Know? The Growing Trend Among Top Producing Dealers Is To Have MULTIPLE WEBSITES! Why? Multiple Websites Is A SMART, INEXPENSIVE Method To Increase Your Internet Search Rankings! Higher Search Rankings Greatly Increases The Likelihood Of Your Customer Finding You! DealerPac.com Is Designed To Work In Conjunction With Your Existing Website As Well As A Great Stand-Alone Full Featured Dealer Marketing System! Set Your Self Apart From the Competition! 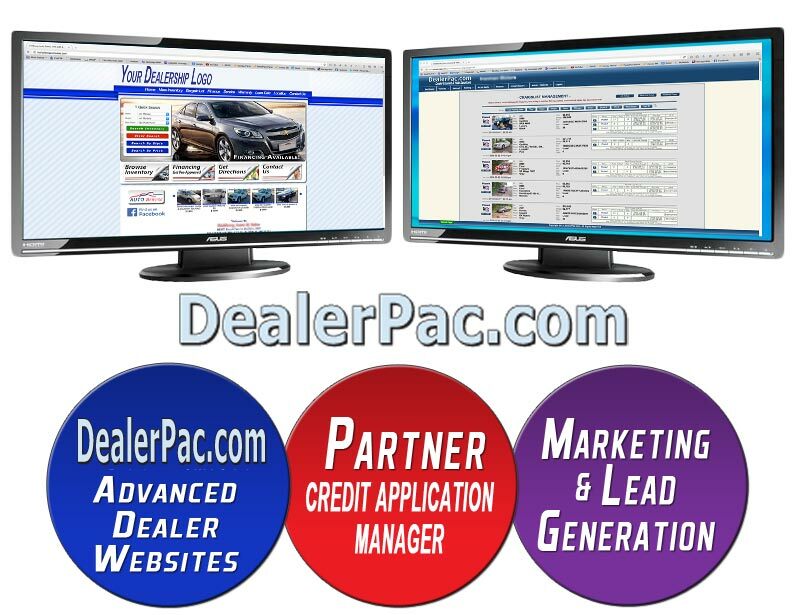 DealerPac.com websites are customizable, full functioning, integrated dealer website solutions designed with the dealer in mind. Did you know that over 80% of buyers visit Dealer's Websites prior to to visiting the lot or making a purchase! That's why it's important to present your dealership in the absolute best light possible! Formatted For Full & Mobile Websites! Including The Ability To Quickly & Easily Customize Your Website Content! Helps People Find You And Your Vehicles On The Internet! With Your Website, Back-Office, And "Partner" - Our OnLine Credit Application Manangement System! Craigslist Posting Including Framed Photos & Templates. Create A Post In Seconds! Post Your Vehicles To FaceBook & Twitter In Seconds! Quickly Post Your Vehicles To Backpage.com, A Growing - Free "Want-Ads" search engine! Save Time with Direct-Edit of your Vehicle Data. Lockable Fields For Imported Vehicles! Import Your Inventroy From 3rd part Websites, DMS Systems (Frazer) or Easy Input! Export Your Inventory To All the Free Sites Plus CarSoup, FindCars, Cars And More! DealerPac.com's Retail Websites Are Fast And Easy For Your Customer To Navigate! Our Back-Office Is Designed To Be Easy And Intuitive! No Hidden Keys, No Hidden Options! Includes web pages For Your Service Department, Body Shop, Detailing, Parts location, Contact And Many More! One Price = Full Package! √ Don't See One You Like? Let Us Know And We'll Build It! To Bring You The Finest In Web Marketing & Retail Financing!!! Web Finance Direct: The Midwest's Premier Full Service Remote Finance Department, With All It's Resources, Experience & Great Customer Satisfaction Is Available To You With A CLICK OF A BUTTON! Close More Deals, Increase Your Bottom Line And Eliminate The Finance Hassles! BONUS - Web Finance Direct Shares 50% Of Back-End Profits With YOU . Provides High Quality, Powerful Retail Dealer Websites As Well As Full Back-End Loaded With Tools! Partner Is A Fully Integrated, Secure, Real-Time Credit Application Management System With Automated Emails, Live Loan Process Status, Communciation System And A Central Hub For All Your Credit Applications. Gives You Control Over Your Own Loan Processors or Easily Send The Work To Web Finance Direct... WITH ONE CLICK! Are You Losing Gross Profit (Sales) By Not Having A Professional Finance Team Behind You? Do You Send Your Hard Earned Prospective Buyers To The Local Credit Union Or Bank - And HOPE THEY COME BACK? Could Your Current Loan Processor Do A Better Job Closing Deals & Keeping You Informed? Are You Working All The Deals Yourself But Could Use A Little Help Here And There? The Midwest's Premier Full Service Remote Finance Department! We Are The Experts In Retail Financing! Web Finance Direct is the professional full service Retail Finance Service Provider. All our Finance Managers are experts in their field with great customer service abilities. We are ready to put our talents & experience to work for you! Retail financing available for all credit profiles... From Sub-Prime to Well Qualified Customers! Providing Safe, Secure, Professional Retail Financing To The Auto, Marine, RV, & PowerSports Industries! Why is this important? The vast majority of "Remote F&I" providers are actually Dealers or individuals working in partnership with other Dealers, both having limited associations and abilities with their lenders. You must sell your vehicle to the Remote F&I Dealer inorder for them to sell it under their name to the client. Confusion to customer - They think they are buying the vehicle from you... but in reality, they are buying the vehicle from the Remote F&I Dealer. You are no longer in control of the sales process. Is the customer being "over-promised" or "over-sold" on products and pricing, ultimately giving your dealership a tarnished name. The customer needs to be "coached" - The Financial Institutions cannot be told that the vehicle Is from another dealer! This could backfire and cause the whole deal to unwind! You need to rely on the Remote F&I Dealer to pay you for the vehicle... and in a timely fashion. You need to rely on the Remote F&I Dealer to pay you full sale price of the vehicle... without the heavy acquisition fees. You need to rely on the Remote F&I Dealer not to sell another vehicle to your client... in place of your vehicle. Have peace of mind knowing that WFD has completely removed these worries, legitimizing the whole process! Plus We Share 50% of Back-End profits. Why Partner With Web Finance Direct? 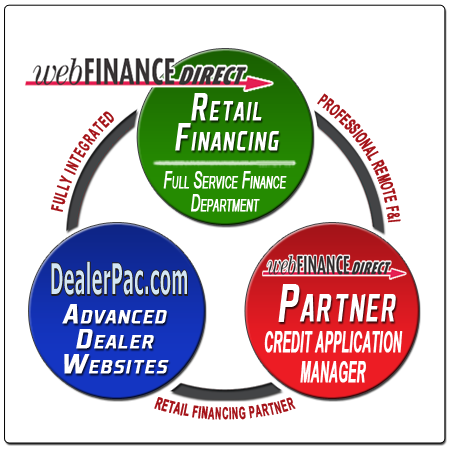 Web Finance Direct removes the financing headache from the Dealer. Gives You The Time To Do What You Do Best... SELL! Our Finance Managers are professional closers working for you. Close More Deals & Increase Your Bottom Line! Seamless OnLine & Manual Credit Applications integrated within your dealer website and back-office. No More Hassles Emailing or Faxing Credit Apps To The Bank! Retail Finance Loans - for all customers. Don't Lose Another Deal Because of Credit or Not Having The Proper Banks Lined Up! Web Finance Direct protects your Front-End profits. Increases Or Maintains Your Bottom Line! Web Finance Direct shares 50% of Back-End profits. Increases Your Net Profit On Each Sell! Web Finance Direct is dedicated to maintain the integrity of your dealership name and reputation by our strict adherence to Web Finance Direct's Full Loan Disclosure policy. Never A Surprise To You Or Your Customer! See Real Time, Anytime - The Current Loan Application Status, History, Closing Dates and more of any loan in process! Automatic Email Notification System. You Are Notified Everytime A Prospective Customer Sends In A Credit Application On One Of Your Vehicles! You Can Link All Your Sites & Advertisement To One Location! You're Always In Contact With Your Finance Manager - Just Like They're Next Door! All Credit Applications Feed Through PARTNER! Using PARTNER As Your Central Hub For All Your Credit Applications Will Reduce Handling Time, Errors, And Lost or Unreadable Paper Copies. PARTNER Stream-Lines Your Finance Sales Process! Save Time And Reduce Stress While Keeping The Customer's Financial Data Secure! You or Web Finance Direct! Easily Transfer The Work To Web Finance Direct At Anytime With A Click Of A Button! You Can Link All your Websites & Advertisements To One Location! I have been using TeamAutoSolutions for 2+ Years, Lloyd designed my Dealerpac website, I love how user friendly this website is, I am not very computer savvy therefore having TeamAutoSolutions manage my website allows me peace of mind, Lloyd is friendly and very helpful if I have any questions about my Dealerpac , When I first started using Dealerpac Lloyd helped me navigate through the website and showed me step by step on how to use the features, A+ would be my Grade for this website. I operate a smaller used car lot in the northern metro area, and have used DealerPac.com for about four years. As I am not that computer savy, Lloyd has been very diligent in helping me address and resolve any computer advertising issues that have arisen. I'm still with his operation as I find it to be of great value. I would support any recommendation for using his services. Working with Lloyd and Dealerpac has been an exceptionally fun and pleasing experience. Lloyd's knowledge of the automotive industry and advertising in this venue has proven to be very profitable to our business. I have worked with Lloyd for over 4 years now and have always been treated well, and felt confident I was getting all his expertise and full attention to detail in his work. A pleasure to work with someone that is so knowledgeable and has the small dealers back. I have worked with other developers and never have I had the personal attention to detail and customization to fit my personal goals and needs as a dealer. Lloyd at DealerPac has been very accommodating in setting up and maintaining our website for over 5 years now. We have tried other website packages but in the end most of them over promise and under deliver. Lloyd and DealerPac are the perfect fit for us. Jeff Rotter Rotter Auto Sales. I have been with Dealerpac for several years now. I like the ease of use. If I need help Lloyd is always readily available to help. The Web site is clean and easy to manage. I have referred some of my friends to Lloyd and they thanked me as they to have liked what they found. A Product Of Team Auto Solutions, Inc.